The nice thing about this shelf design is that it's just as easy to build three (or more) as it is to build one. Each requires about a board foot of lumber. And there are only three parts: two brackets and a shelf. Plus, there's a unique hanging system that's completely invisible. both brackets. Then lay out and cut the shape of the brackets at each end of the blank, see Fig. 1 and the pattern below. Before cutting the brackets to length, rout a bullnose profile on the front and curved edges. You don't need a special router bit to do this. 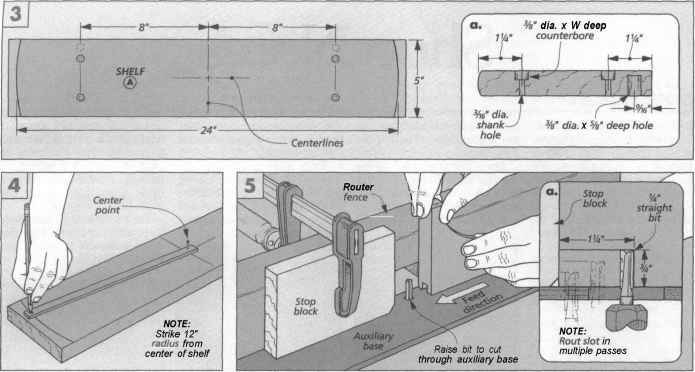 Just use a V&" round-over bit in the router table with of the cutting edge exposed, see Fig. 2. With the edges routed, cut the brackets to final size. 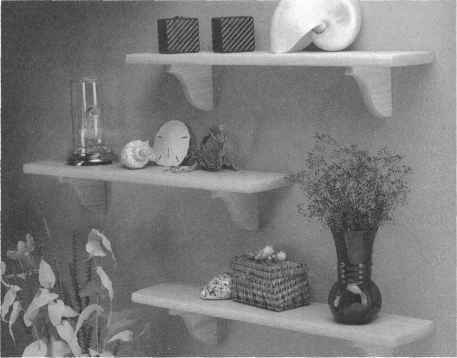 SHELF. For now, set the brackets aside and begin work on the shelf (B), refer to the drawing below left. I started with a blank 5" wide and 25" long, see Fig. 3.
brackets, see Fig. 3a. These are measured from the center and are 16" apart. Then, flip the shelf over and drill a couple holes in the bottom of the shelf, see Figs. 3 and 3a. These holes provide pockets for the hanging system to hook into. Now, there are just a couple things left to do to the shelf. First, cut a gentle curve on each end, see Fig. 4. 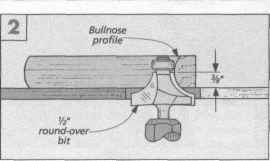 Then on the front and ends of the shelf, rout a bullnose profile just like the one on the brackets, see Fig. 2. SLOTS. The shelf and the brackets are about ready to be screwed together, but there's still one more thing to do. 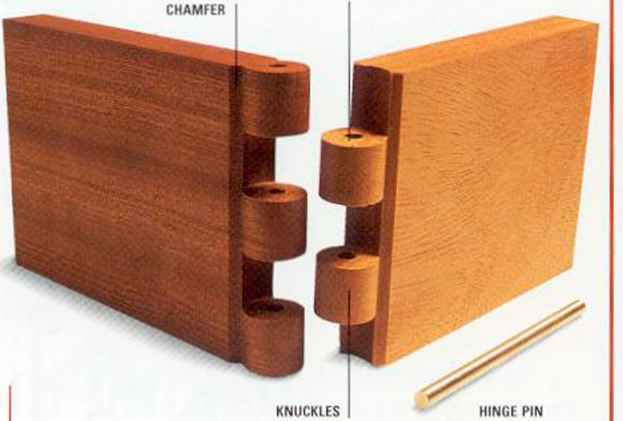 To hide the hanging hardware, you need to rout a slot in the Dack of each bracket, see Fig. 5.1 did this with a 1 j" straight bit in the router table. And to make this procedure safer with such a small workpiece, I added an auxiliary base to cover the large opening in the table. Then I clamped a scrap block to the fence to act as a stop. ASSEMBLY. With the slots cut, the shelf can be screwed together. Plug the holes with short pieces of 3/£s" dowel and trim them flush, see Fig. 6. Then to finish the shelf, I wiped on a few coats of an oil finish. Hanging SYSTEM. Okay, now it's time to hang the shelf. This shelf hangs on a couple common L-hooks, see Fig. 7. They slide into the slots in the brackets and then hook into the holes on the bottom of the shelf. There are at least a couple ways to secure the L-hooks into the wall. You can either screw them directly into the studs. Or, if you're going into drywall, you can use dry-wall anchors, see the box at right. vide enough holding power when screwed directly into drywall. So what do you do? I found that a couple drywall anchors hold the L-hooks well. 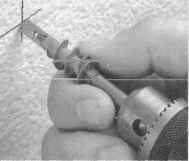 And the nice thing is their tips are shaped like spade bits, so you don't need to drill a pilot hole, see photo. 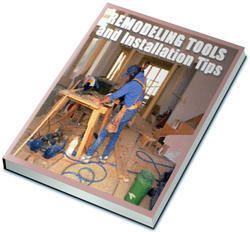 Drywall anchors are made from metal or plastic and are available at hardware stores. (Or you can order them from the mail order source in the box on page 31.) Note: These anchors won't work in plaster (or a stud).